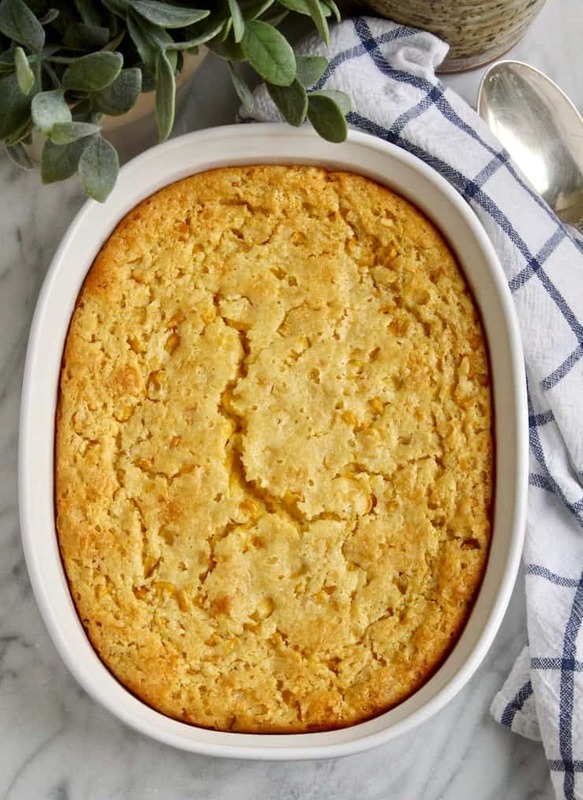 Corn Soufflé, simple and delicious corn casserole, an easy side dish for the holidays, and a family favorite! 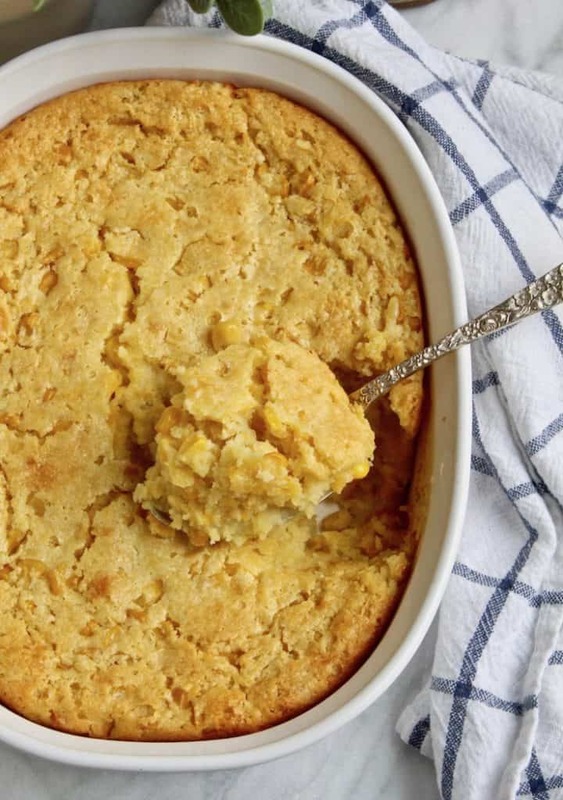 Thanksgiving is fast approaching and that means I’ll be making this corn casserole for PB&G. 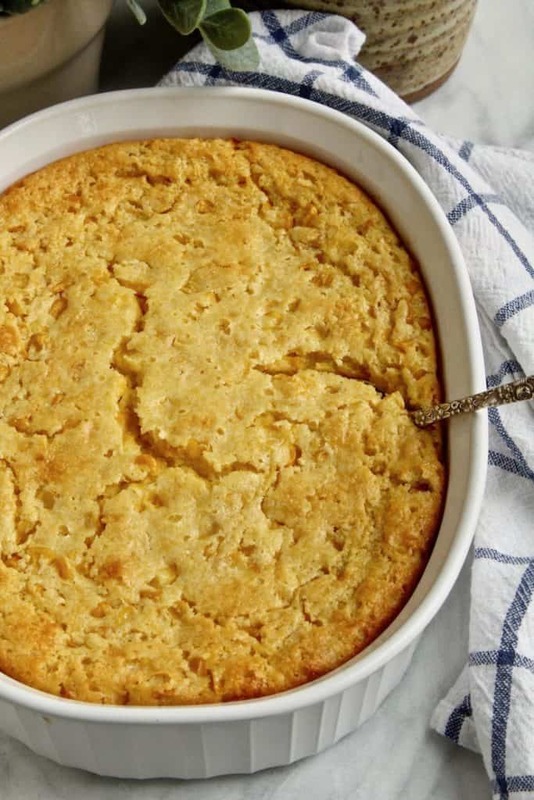 She calls it corn soufflé, but technically speaking, it’s not really a soufflé. But I can’t call this anything else. So who is PB&G anyway? She is my middle child. My daughter with a heart of gold, full of empathy for other people, principled, sometimes stubborn and feisty. She’s very creative and hilarious, quick to giggle and make us laugh. She also was a vegetarian for over 7 years. When she was 13, she announced at the dinner table that she was no longer going to eat meat. From that day forward, no red meat, chicken or fish, at all. She also dabbled in veganism, but that didn’t last. Once she walked in the house and the first thing she said, yelled actually, was “It smells like dead animals in here”. Nice to see you, too. The thing about going vegetarian at such a young age is that she really didn’t eat very healthy. I swear she was surviving off of simple carbs and nothing else. Lots of bagels and PB&J sandwiches. Then one day when she was 20 and home for Thanksgiving, she decided she wanted bacon. So she had bacon and went back to eating meat, but now, no pork. She and Always Hungry do not eat pork because they say the pig is the smartest animal. This is what they tell me. During the holidays, especially Thanksgiving, there wasn’t much PB&G could eat. No turkey, gravy, stuffing, ham. She had corn casserole somewhere and loved it, so I started making it for her. Then everyone else started asking for it, my aunt and cousin, my mom. It is a required holiday side dish in our house, as is Cheesy Potatoes. PB&G was home a week ago and said she was craving these two dishes, so I made them for her. What is this corn soufflé I speak of? I clipped this recipe out of the paper years ago, and when I recently did some research, I found lots of versions of this corn casserole. I’m thinking this might have originated with Jiffy corn muffin mix. 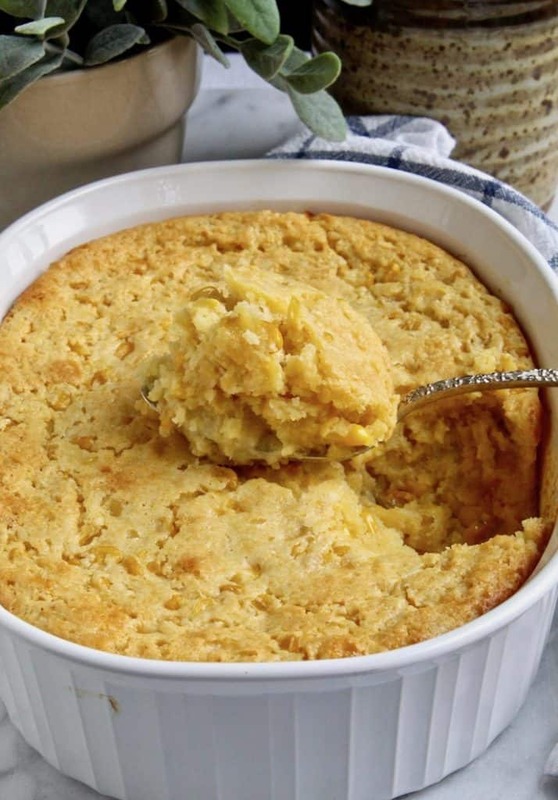 This corn soufflé (or escalloped corn, or corn casserole) is very simple to throw together. 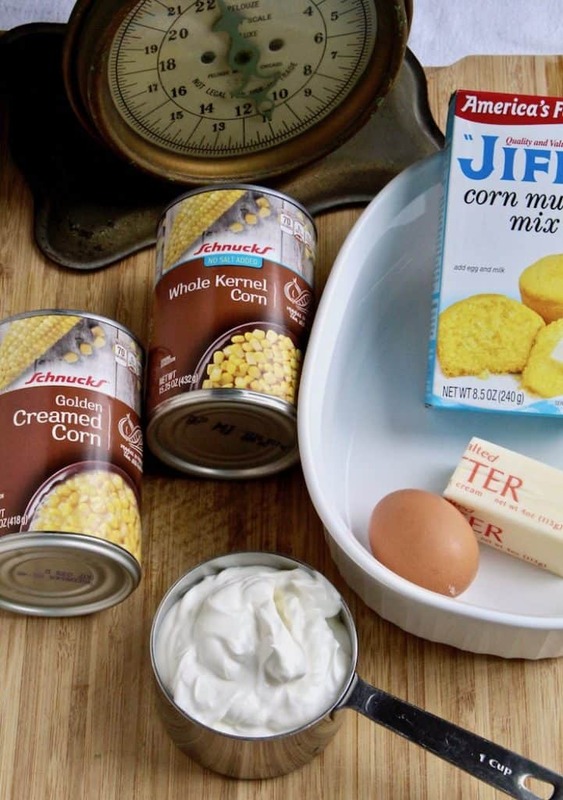 Canned corn, egg, butter, sour cream and corn muffin mix. Mix it all up, pour in a casserole dish and bake. This time, the canned corn I used had sea salt, pretty trendy. Also, the corn muffin mix I used said it was vegetarian, never saw that before. I wonder what is in the regular corn mix (wink, wink)? And there you have it, probably the easiest side dish I make on Thanksgiving. 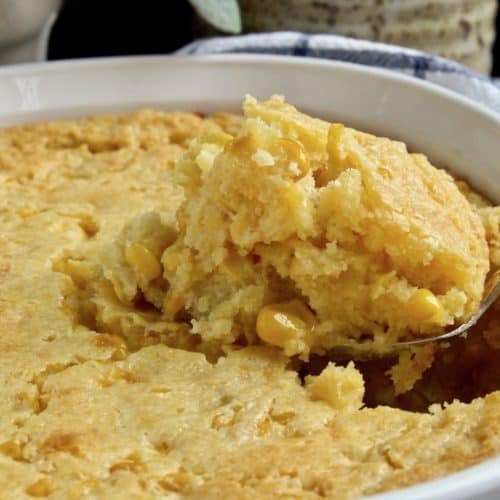 So PB&G, here is your corn soufflé recipe. It’s time for you to start making this yourself. You don’t have to save it for the holidays, make it any time you have the craving. Enjoy, Mom. 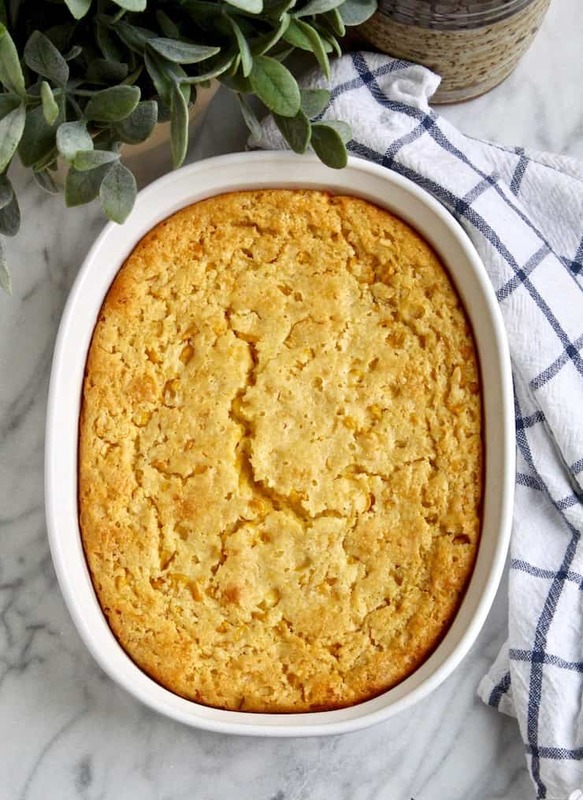 If you’ve tried this Corn Soufflé or any other recipe on the blog, then don’t forget to rate the recipe and let me know how yours turned out in the comments below ~ I love hearing from you! You can also FOLLOW ME on FACEBOOK, TWITTER, INSTAGRAM and PINTEREST to see more of what I’m cooking in my kitchen and recipes. Never miss a post ~ sign up for The Hungry Bluebird Newsletter for a weekly email of new content. Other easy sides for the holidays are these Brussels sprouts and honey brown sugar glazed carrots, super easy and delicious. 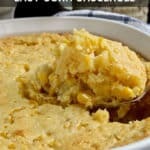 Easy corn casserole for the holidays, made with corn muffin mix, canned corn, egg, butter and sour cream. It's a favorite holiday side dish. Lightly butter a 2-quart casserole dish. My mom is the best. This corn is the best. Love you!! That looks delicious! Yum-comfort food at its finest. P.S.-I love the nickname your family has for you-very fitting! Ha! Hi! This recipe looks fantastic and simple. I also looked up some corn casserole recipes and found a lot that are almost identical as yours but have 2 eggs and a full stick of butter. Have you always made it this way and any ideas what the difference in butter and eggs would result? Thank you! I’ve always it made this way. A full stick of butter is too much for me, not sure about two eggs. I’ve seen that version also, I’ve just always stuck with this recipe. Looks amazing! I want to make this for thanksgiving this year. How far I advance could I make it, or is it a dish best prepared on thanksgiving day? I always make it on Thanksgiving day. However, I’ve read you can make it up to 24 hours in advance, cover with plastic wrap and refrigerate, let sit 30 minutes on counter and then bake. Or make ahead and bake, then reheat in 300° oven for 10-20 minutes to heat through. I have a very similar recipe that a mom at my son’s pre-school gave me well over 25 years ago. It uses 6 tbs of butter & two eggs. I make it ahead of time, bake, and then re-heat in the microwave before serving. It always comes out perfect. Do you have to add ingredients listed on the corn bread mix as well? Easy to make and the family loves it..I just use Jiff corn muffin mix..nothing fancy and follow the recipe. 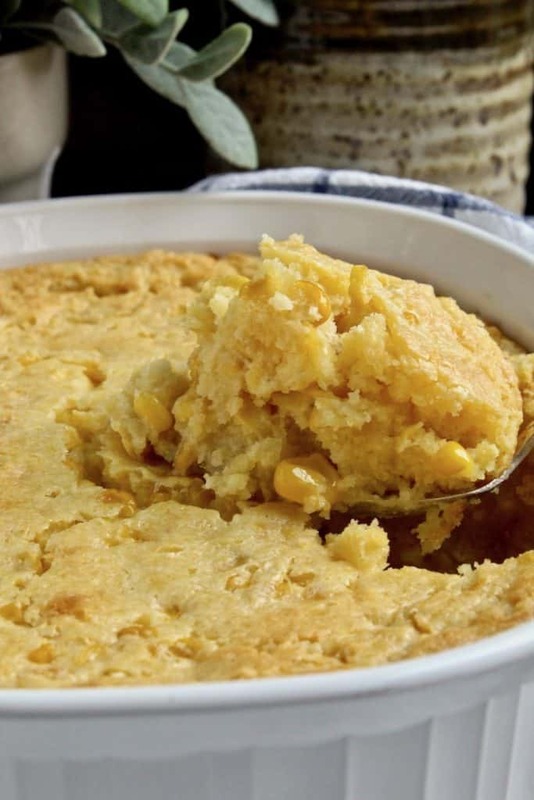 Growing up my mother would always make Corn Pudding to take to church dinners, people always requested it, I hated it. Yesterday, my friend brought me a large serving of what she calls Corn Soufflé. It was delicious! Needed a little salt but wonderful. Going to try this recipe for Christmas Eve dinner next week! with a can of sweet condensed milk.